Natural gas utilities received 11.7 billion cubic metres of total marketable gas in September, up 7.3% from the same month in 2014 and the sixth successive year-over-year increase. Gas utilities sold 5.4 billion cubic metres of natural gas in September, up 8.5%. At the same time, revenues were down 30.3% from 12 months earlier to $789.9 million. Sustained low prices have continued to depress natural gas revenues. 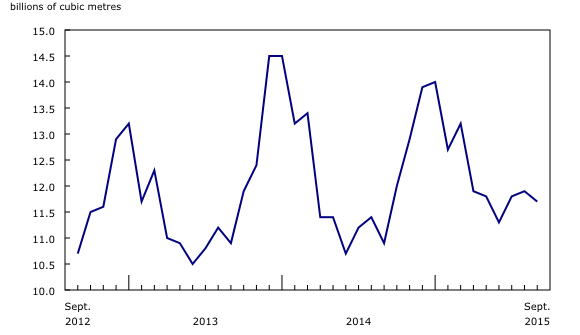 In September, total receipts of marketable gas in Alberta were up 12.0% to 8.5 billion cubic metres. Meanwhile, British Columbia posted a 2.0% decrease to 2.8 billion cubic metres. By province, Alberta (up 10.4% to 2.9 billion cubic metres) and Ontario (up 9.8% to 1.2 billion cubic metres) reported the two biggest changes in sales of natural gas compared with September 2014. The volume of sales to the residential (+4.3%) and industrial (+10.0%) sectors was up, while the commercial sector was down 0.7% compared with the same month a year earlier. Lower natural gas prices contributed to decreased year-over-year revenues in every province in September, led by Alberta (down 57.1% to $176.3 million) and Quebec (down 19.5% to $89.5 million). 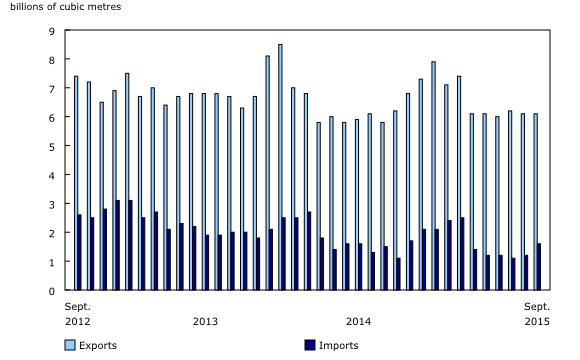 Canada's imports of natural gas rose 10.5% to 1.6 billion cubic metres in September. This was the first year-over-year gain since March 2014. Exports of natural gas by pipelines to the United States increased 5.2% to 6.1 billion cubic metres. Data for July and August 2015 have been revised. Import and export data are a combination of National Energy Board and survey data. Marketable gas data reported for British Columbia also include data for Yukon and the Northwest Territories. Total marketable gas includes gas received from fields and processing or reprocessing plants after re-injection, field uses, plant shrinkage, plant use and losses have been deducted.